Automated Gates and Equipment sends out a monthly newsletter featuring gates we have installed and that we feel are truly works of art. 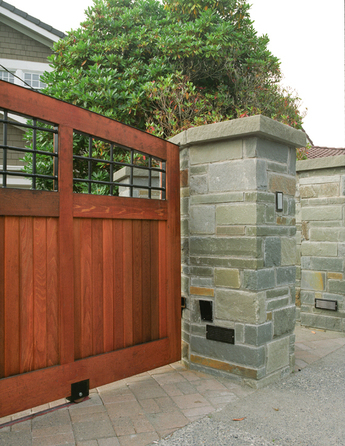 If you miss a month, don’t worry, we’ll be keeping all our beautiful gates listed on our website for you convenience. If you would like to be added to our mailing list, simply fill out the form below! November's Gate of the Month is just in time for Turkey Day. This beautiful gate features a custom paint color that blends seamlessy with the lovely mason work. It features a stand alone keypad for easy entry for all of those holiday guests and the in-ground operators keep it sleek and streamlined. For this month's gate, our customer chose solid panels to increase privacy. Typically, we would break it up by including linear mesh, but our customer wanted something with more of an organic feel. This gate includes plasma cut panels that were designed to mimic reeds growing in the wild. The most interesting feature, however, is that this gate is not centered on its pillars like most gates are. Our customer chose to offset the gate, giving them a wider range of motion, allowing the gate to open wider than 90 degrees. A gate with renaissance style. Classic gate with Northwest flair!